Put the eggs into a saucepan of water, and bring to a boil. Reduce the heat and simmer for 8 minutes. Drain the water and run the eggs under cold water to cool. Peel the eggs and set aside. In a medium saucepan on medium heat, quickly toast the mustard seeds, allspice berries, cloves and cardamon pods for about 2 minutes, until the spices begin to release their fragrance. Add in the red wine vinegar, water and bay leaves and bring to a boil. As soon as the liquid boils, add in the red cabbage and turn off the heat. Allow to rest for 10 minutes, stirring occasionally, so the red cabbage is covered by the liquid as it softens. In a 1-liter jar, layer in the red cabbage and the eggs, reserving a bit of red cabbage for the very top. Pour in the pickling liquid so that it covers all of the eggs. If you have room on the top, pack in the reserved red cabbage. Discard any excess liquid, but transfer any spices that may be at the bottom of the saucepan into the jar. Cover, gently swirl the jar, and set it in the refrigerator for at least 24 hours, but up to 3 days. When you are ready to serve, carefully remove the eggs and slice each in half. Serve the pickled red cabbage alongside the eggs. Adapted from Jamie Oliver's Everyday Superfood. This recipe makes six Pink Pickled Eggs, but you can easily double, triple or even quadruple the recipe. 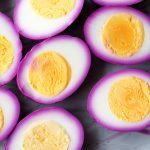 Get this recipe for Pink Pickled Eggs at https://www.theworktop.com/breakfast-brunch-recipes/pink-pickled-eggs/.